This year the HDP / WPC Stage will be completed by dark brooding chanting flowing in unison with crunching psyhedelic doom riffery… it can only be Salt Lake City’s dynamic double-headed beast Eagle Twin. 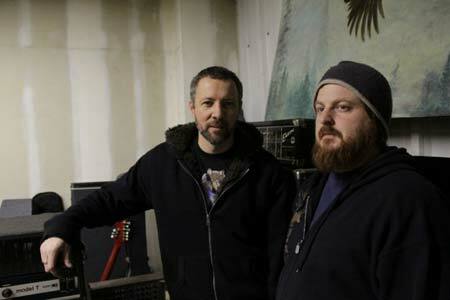 Describing themselves as “heavy music overflowing with animistic riffs and myths”, Eagle Twin’s creators Gentry Densley (guitars, throat, words) and Tyler Smith (drums, fists, fire) build epic compositions drawing on multiple levels of the collective unconscious, mixed with epic tales and dark poetical themes and who also revel in modifying their own gear to ensure these sounds are blasted through with a crushing precision. Their hard hitting drum and guitar soundscapes shall be gracing the evening hours of the Underworld’s stage and we hope to be treated to some of the band’s finest offerings including pieces from the debut LP, 2009′s ‘The Unkindness Of Crows’, as well as their most recent Southern Lord release ‘The Feather Tipped The Serpent’s Scale’ (2012). Appearing on the same stage as fellow duo (and 2010 split release partners) Pombagira, Eagle Twin are set to bring a fitting gutter punch of devastation as the final addition to the already ludicrously low-end heavy HDP / WPC Stage for 2014.